Hi everyone! I hope you had a good week and a happy Thanksgiving! I had a nice quiet holiday with lots and lots of food. Since Thanksgiving is supposed to commemorate a treaty signed between the Wampanoag people and the English settlers, and Friday was Native American Heritage Day, I would like to dedicate this blog to all the Indigenous People of the Americas. Native American Heritage Day is a day that recognizes all the contributions Native Americans have made as well as their heritage and history. I thought it would be nice to research some Native American stories about bats. I couldn’t find any Wampanoag stories, but I did find a nice Ojibwe one. This story describes how bat came to be. It starts with the sun getting stuck in the branches of a tall tree. A little squirrel saw him and desperately tried to save him. The little squirrel got badly burned, his skin got stretched, and the bright sunlight blinded him. 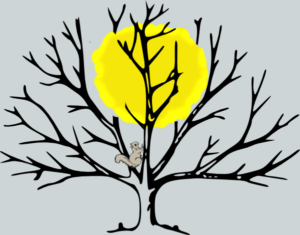 Despite his injuries, the little squirrel kept trying and eventually saved the sun. As a reward for the little squirrel’s heroism, the sun helped the little squirrel. He stopped the squirrel’s pain and gave him the ability to fly. Little squirrel became the first little brown bat. The Ojibwe people tell the story much better than I do, so if you would like to read it, you can find it here.